Here are a couple excerpts from actual customer testimonials / reviews of Fred’s Junk Removal Service. Thank you to all of our customers that took the time to let others know about our excellent customer service and dependability. Moving can be a stressful and expensive time, but Freds Junk Removal made the whole process that much easier. I highly recommend them for all your junk removal needs! 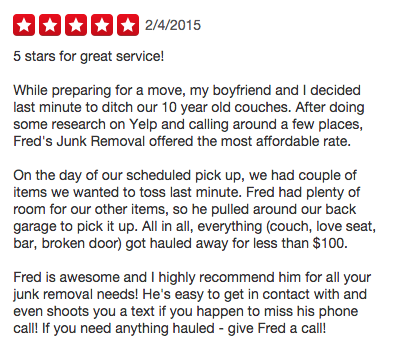 Fred is awesome and I highly recommend him for all your junk removal needs! He’s easy to get in contact with and even shoots you a text if you happen to miss his phone call! If you need anything hauled – give Fred a call! It is great having someone do what they promise with no hassles at a fair price. Very professional and would definitely use him again and highly recommend to others. really appreciated that his communication was very good. He showed up right on time and even called about 10 minutes in advance to confirm that he was about to arrive. The price was the same as listed on the website, what I was quoted, and what was confirmed at the pickup. Would recommend for others and will use again if I need a large-item disposal.